Identification of the two dark ibises (genus Plegadis) can range from easy to impossible, depending on their plumage stage. In most parts of Missouri, White-faced Ibis (Plegadis chihi) is more regular and numerous than Glossy Ibis (Plegadis falcinellus), but they cannot be firmly identified on the basis of probability. (a) White-faced Ibis has pinkish-red to burgundy facial skin, with a striking rim of white feathers that surrounds the facial-skin patch and extends behind the eye. The eye and the legs are red. (b) Glossy Ibis has dark gray facial skin, with thin pale-blue or gray-blue margins that are also skin and do not extend behind the eye. This bluish skin assumes a distinctive shape, as shown in field guides: the upper margin is a bit thicker, especially in the middle, while the lower one is thinner and follows the edge of the dark skin closely. The eye is dark brown, and the legs are gray-green with reddish joints. These differences are easily visible in a good scope view; it is best to note as many of them as possible. Other differences mentioned in field guides (such as bill color, or color of gloss on portions of wings) are hard to judge and perhaps not diagnostic. Identification is complicated by the possible presence of hybrids between the two species. These have been observed in a number of states, including at least two presumed hybrids in Missouri. Their plumage characters can be intermediate or closer to either one of the parent species. Excellent views and/or photographs are necessary to make this determination, and some birds simply cannot be identified with certainty. An article that discusses hybrids was published in North American Birds in 2003: http://okbirds.org/nab-v57-n1-2003-glossy-whitefaced-hybridization-new.pdf. Another was in Colorado Birds: http://cobirds.org/CFO/ColoradoBirds/InTheScope/32.pdf. 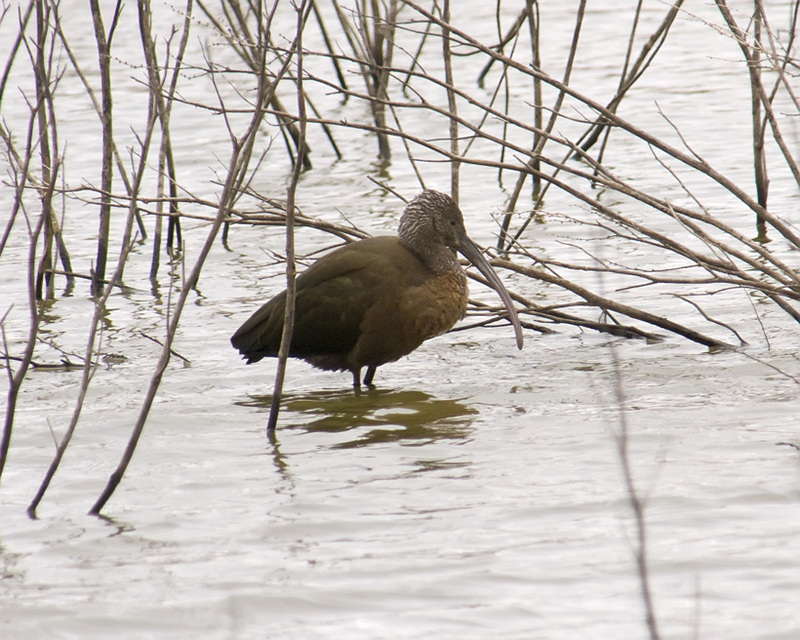 (a) White-faced Ibis retains its red eye and reddish/pinkish tinge to the gray facial skin; the red leg color is lost. (b) Glossy Ibis retains plain dark gray facial skin with the narrow pale blue or pale gray margins, although these can be harder to see than in breeding plumage. Thus identification of adults in fall and winter is possible but requires close views and should be substantiated with photographs. 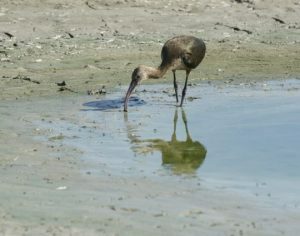 (a) Young White-faced Ibis develop the red eye color and reddish-tinged facial skin over time. (b) Most young Glossy Ibis show at least a subdued version of the pale facial margins, and their distinctive shape (National Geographic Field Guide to Birds of North America, 6th ed. ; also illustrated, but not pointed out, by Sibley). The Missouri Bird Records Committee requests documentation of dark ibises only at certain times of year: White-faced in summer and winter (nearly all records are during migration) and Glossy in fall (there is no firmly established record beyond August). Most of the time, it is eBird that will ask for details about these species, and it is important to be cautious and thorough in backing up our identifications with good verbal descriptions and, if possible, clear photographs. This is one of those cases where casual listing with no details just isn’t enough.